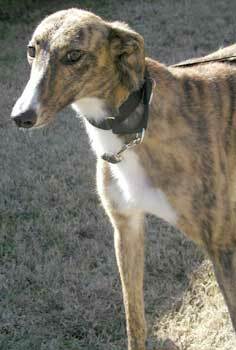 Dafney, aka Dots Dafney, is a beautiful 3-year-old dark brindle female with a white-tipped nose and long bib on her chest. She was born November 5, 2001. Her sire is Molotov, her grand-sire is HBs Commander, and her dam is Dots Rolly. If you look at Molotov, you will see where she gets her striking bib. Dafney's brothers are Dasher and Dinero. Dafney has been in a home for almost a year, but it was not to be her forever home. She is a little bit shy and is extremely affectionate. 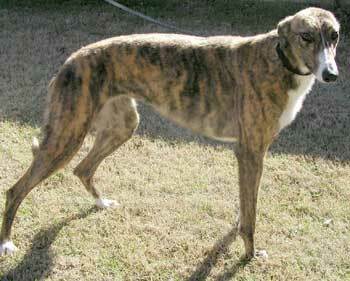 Dafney is in a foster home with two other greyhounds and a cat. Dafney is small animal and cat tolerant.